Author(s): Marina A. Tudoran, Mihai V. Putz. Laboratory of Computational and Structural Physical-Chemistry for Nanosciences and QSAR, Department of Biology- Chemistry, Faculty of Chemistry, Biology, Geography, West University of Timisoara, Pestalozzi Str. No. 16, RO-300115, Timisoara, Romania. With the rise of the nanoscience era in general and that of graphene structure and nanopatterns especially their precursors by organic compounds and specifically the benzenoid systems become most regarded due to the benchmarking information they provide and transfer from nano-to-macro chemistry and materials. In this context, chemical graph theory and methodology are reviewed from the fundaments, via a historical development of a molecular graph and of their motivation, to the algebraic polynomial formulation to the powerful quantum representation in the close relation with the celebrated Hückel molecular orbital method; in all these stages molecular graph theory benefits from the adjacency information of atoms in molecules, in terms of vertices linked by edges representing the chemical bonds. The chemical topology to chemical reactivity passage is here advanced with the aim of coloring of matrix of atoms’ adjacencies in molecules by standard reactivity indices as of electronegativity and hardness, along with the recently introduced chemical power and the electrophilicity, all being able to clarify bonding in a mechanistic/causal manner as based on the first principles of quantum chemistry. 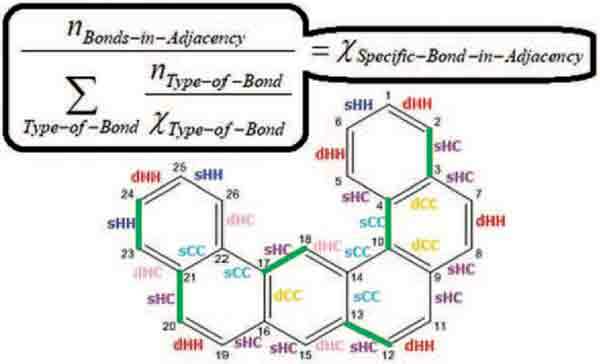 The actual topo-reactivity coloring methodology further uses the fragments of atoms in molecules as centered on the chemical bonding under concern (the so called specific-bond-in-adjacency, SBA), either single or double and when the hetero-distinctions are made possible. As an application, a series of paradigmatic polycyclic aromatic hydrocarbons (PAHs) is analyzed from the present topo-reactivity methodology both for in gas and liquid phase to yield the conclusion that the electrophilicity is the actual driving force triggering their reactivity, thereby refining previous molecular-orbital electronegativity-based approaches. The actual review and topo-reactivity methods are of general value to be used in the XXIth-century quantum nanochemistry research and developments in organic chemistry and chemistry of materials. Keywords: Adjacency matrix, chemical graph theory, chemical hardness, chemical power, chemical reactivity, electronegativity, electrophilicity, graph enumeration, graphs’ polynomials, Hückel molecular orbital theory, polycyclic aromatic hydrocarbons (PAHs), toporeactivity graph matrices, weighted graphs. Affiliation:Laboratory of Computational and Structural Physical-Chemistry for Nanosciences and QSAR, Department of Biology- Chemistry, Faculty of Chemistry, Biology, Geography, West University of Timisoara, Pestalozzi Str. No. 16, RO-300115, Timisoara, Romania. Keywords:Adjacency matrix, chemical graph theory, chemical hardness, chemical power, chemical reactivity, electronegativity, electrophilicity, graph enumeration, graphs’ polynomials, Hückel molecular orbital theory, polycyclic aromatic hydrocarbons (PAHs), toporeactivity graph matrices, weighted graphs. Abstract:With the rise of the nanoscience era in general and that of graphene structure and nanopatterns especially their precursors by organic compounds and specifically the benzenoid systems become most regarded due to the benchmarking information they provide and transfer from nano-to-macro chemistry and materials. In this context, chemical graph theory and methodology are reviewed from the fundaments, via a historical development of a molecular graph and of their motivation, to the algebraic polynomial formulation to the powerful quantum representation in the close relation with the celebrated Hückel molecular orbital method; in all these stages molecular graph theory benefits from the adjacency information of atoms in molecules, in terms of vertices linked by edges representing the chemical bonds. The chemical topology to chemical reactivity passage is here advanced with the aim of coloring of matrix of atoms’ adjacencies in molecules by standard reactivity indices as of electronegativity and hardness, along with the recently introduced chemical power and the electrophilicity, all being able to clarify bonding in a mechanistic/causal manner as based on the first principles of quantum chemistry. The actual topo-reactivity coloring methodology further uses the fragments of atoms in molecules as centered on the chemical bonding under concern (the so called specific-bond-in-adjacency, SBA), either single or double and when the hetero-distinctions are made possible. As an application, a series of paradigmatic polycyclic aromatic hydrocarbons (PAHs) is analyzed from the present topo-reactivity methodology both for in gas and liquid phase to yield the conclusion that the electrophilicity is the actual driving force triggering their reactivity, thereby refining previous molecular-orbital electronegativity-based approaches. The actual review and topo-reactivity methods are of general value to be used in the XXIth-century quantum nanochemistry research and developments in organic chemistry and chemistry of materials.